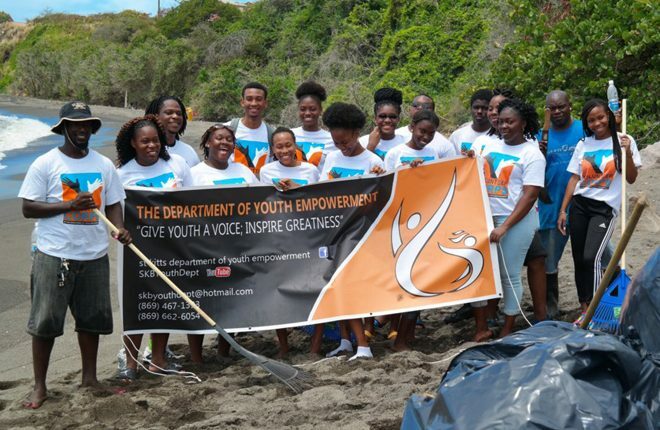 (SKNIS): A civic-minded citizen partnered with the Department of Youth Empowerment over the weekend to clean up the bay at Lime Kiln, making it safer and healthier for residents that frequent the area. On Saturday, Kia (pronounced Kai) Liburd from Real One’s Music Group, used the services of the department’s Volunteer Corps to transform the environment. 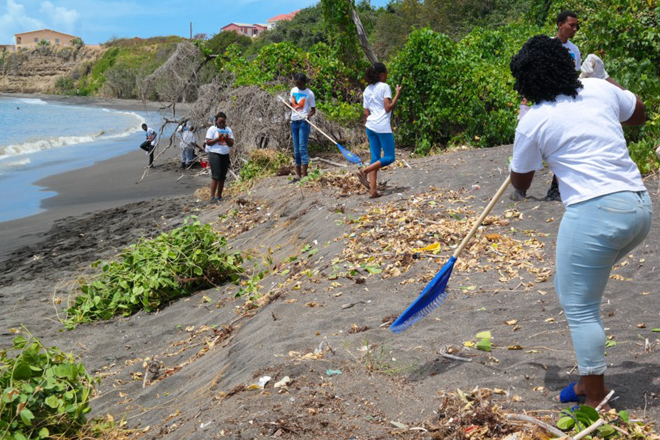 The 24-year-old young man is also a member of the corps, and he along with 15 of his peers, Abraham “Shabo” Dasent and others from the community, spent much of the morning on Saturday (March 24) removing garbage from the bay. It was enough to fill more than 20 large heavy duty garbage bags. Mr. Liburd said the clean up was successful and that he and his music group were looking forward to continue collaborating with individuals and agencies to benefit communities and residents across St. Kitts and Nevis. Youth Officer, Sharon Cannonier, referred to the large amount of garbage that was collected and disposed of, and called on residents to be more conscious of their impact on the environment. Acting Director of Youth, Pierre Liburd, saluted the young activist for his willingness to register to be a member of the corps and for taking the initiative to organize the bay cleanup.